Asashi 6.0″ Hair Scissors Light Blue Titanium Hair Shears. These are the Asashi 6.0″ Hair Scissors Light Blue Titanium (Flowers and Butterflies print) with an offset grip and easy click beautiful studded tension adjustment knob. 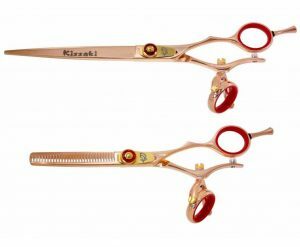 Featuring the Kissaki ultra sharp Convex edge shaped using CNC technology which allows for very fine tolerances in grinding and sharpening of shears and then hand honed to achieve precision tolerances and razor sharpness not otherwise attainable on a normal convex edge. 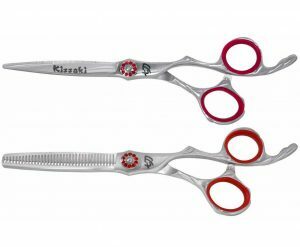 The beautiful Hair Cutting Scissors are made from the Highest Quality Forged Japanese Hitachi SUS 440C Stainless Steel (Rockwell Hardness of 60+) and coated with beautiful Light Blue Titanium for extended durability. This Asashi 6.0″ Hair Scissors Light Blue Titanium Hair Shears is an ideal Hair Cutting Shears for professional Hairstylists, Hairdressers and Barbers in high volume hair cutting salons.